Fashion is a tool, your body is the foundation and your style is what will make you look and feel good. After doing a bit of reading and keeping up with the hints and tricks to a lady dressing her best, we have found that one should start with their body type. I like the idea of minimize and emphasize, take these words and tuck them in the little side pocket of your purse when out shopping. Five common body shapes consist of triangle (pear), inverted triangle (the upside down pear), rectangle (athletic), apple shape, and the hour glass. Here I will give you a few hints on how to effectively start the thinking process when dressing these body types. For the triangle body shaped ladies you should minimize the hips and emphasize the upper half of your body. Find the pieces that take away from your bottom but accentuate your upper half. Add bright colors and embellished tops for a fun fit. If you are the lady considered to have the inverted triangle body shape minimize broad shoulders, and emphasize your waist and hips. Try to balance out your upper half while creating a look to show distance on the lower half (from the hip line to your feet) of your body. Go with light colors and keep your top area light on accessories (think bangles or rings over chunky necklaces and earrings). Ladies who are fit and have the athletic body (rectangle) type minimize the narrow mid-section and emphasize your shoulders and waist area. This body type is described as ‘straight up and down” and so it’s simple just add volume to bring the desired shape you want to see alive. Don’t ever be afraid to let your fabrics drape you and mix up the textiles. 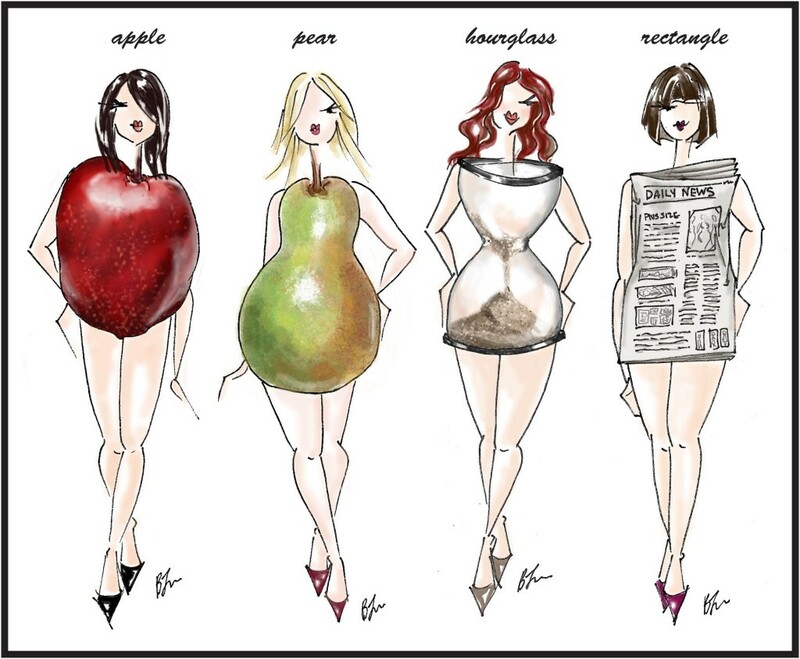 When you’re round and considered apple shaped, minimize your larger mid-section and emphasize your bust and hips. Your waist line is seen as larger and soft (hence the round shape) so your job is to create structure especially at the top. Try prints and patterns they, hide things we didn’t know could be hidden. The most common desired shape, the hour glass shape keep your curvy thighs and full bust to a minimum and emphasize your waistline. Yes, your waist line is your key. Keep it simple with solid colors and don’t allow prints to take away from your shape. Shaping your style should be easy breezy and not such a task. We wanted to keep this short and sweet and throw the key ideas out there for your next closet raid or shopping trip, hopefully we have done just that.